Scripts in the flesh: Corner Gas Animated Live Table Read at Hot Docs Ted Rogers Cinema Featuring the Full Cast and Special Guests! Are you going to be in Toronto on Thursday, March 29th at 7pm? Think there’s not a lot going on? 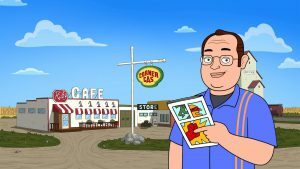 You’re so wrong, because Hot Docs Cinema is hosting a live table read with the cast of Corner Gas Animated! There, you’ll see the cast read through an episode and watch an episode BEFORE it’s released! Pretty cool, eh? Our good friends Colin Mochrie and Deb McGrath will be joining us too! Tickets are still available but they’re going like chili cheese dogs. Get more details and snag tickets here while you still can!